Stand together, build together Your Voice. Your community. 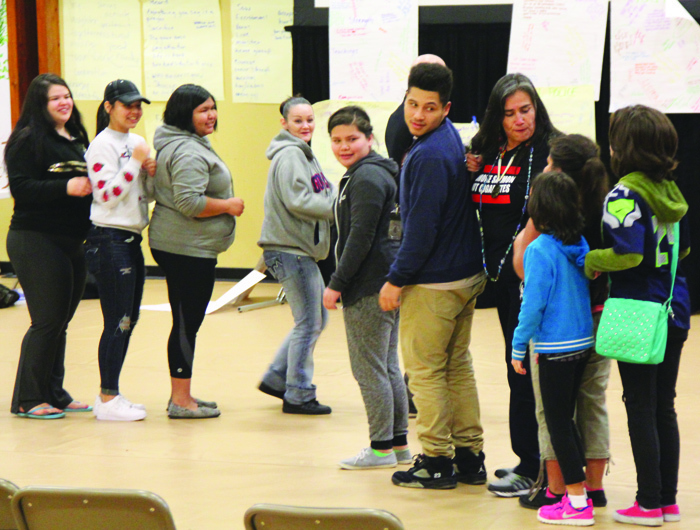 February 25-27, the Tulalip Tribes hosted their very own Gathering of Native Americans (GONA) at the Don Hatch Youth Center. Our three-day GONA was an event inspired to bring our community together to work on creating a vision for a healthy community. Tulalip was fortunate to be nominated as one of the eight tribes in the United States by the Indian Health Service to serve as a Community Partnership grantee. 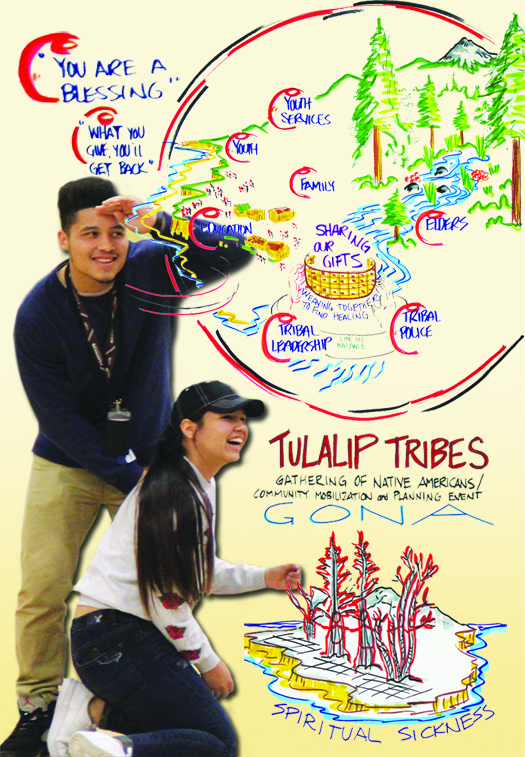 As a grantee, Tulalip received the materials and resources necessary to undergo an intense community training and technical assistance that became our GONA. GONA is for Native Americans and others who want to become change agents, community developers, and leaders. The four parts of GONA (Belonging, Mastery, Interdependence, and Generosity) incorporate the values of four levels of human growth and responsibility that are found in Native cultures. GONA is a safe place to share, heal, and plan for action. The three-day event focused on increasing the strengths of Native youth and community, healing the past and building the future. Over the last few years, countless GONAs have been held all over North America. Thousands of Native people from hundreds of tribes with their friends, families, and communities have experienced the powerful, culturally-centered training and resources GONA offers. Through the four components of Belonging, Mastery, Interdependence, and Generosity we start to examine how to be an active participant in our own life and in creating a healthy community. Belonging. Day 1 of Tulalip’s GONA started off by building and strengthening the sense of team, family and community. A place for all ages, a place for all kinds of people. The first day represents infancy and childhood, a time when we need to know how we belong. It is the most important first lesson a person must learn to live comfortable and to work effectively. Mastery. After dinner, day 1 moved to the component of gaining mastery and healing from what holds us back. Empowerment, for the individual and community. This second stage honors adolescence as a time of vision and mastery. Understanding our Tulalip communities and the local contexts that inform work in partnership with other tribes/communities/governments. Interdependence. Day 2 was dedicated to working together interdependently for positive change. A day of action and community leadership. The third stage is symbolized by adults, integral and interdepending within their families and communities. How do we interconnect with our environment and social network of our community? Generosity. Day 3, the final day of our GONA was all about giving back to self and community. The final stage honors our elders, who give their knowledge and teaching to our generations of the future. Looking at our responsibilities to give back to our communities and share graciously. During each day, GONA attendees participated in various team breakout activities, heard and told stories integral to our culture, and helped to create individual affirmations and community goals. 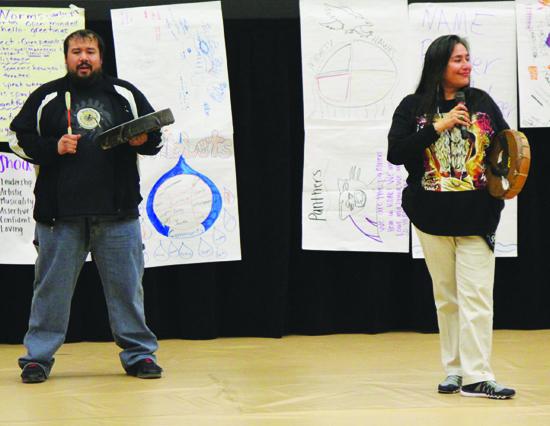 Storytelling is traditional for Native peoples. Oral histories and legends were used to transmit knowledge, teachings, and values from one generation to the next. During GONA, storytelling was used to convey the same teachings as we heard, valued, and respected everyone’s contributions while establishing a foundation for a community-wide prevention plan. The group and team activities were all exercises that demonstrated the core components and helped participants identify some of the rituals or ceremonies from Tulalip culture that have helped our community to remain healthy and in balance. The activities also provided everyone with the opportunity to embrace wellness while recognizing the importance of traditional healing practices. This entry was posted in Local News, News, Tulalip News and tagged community, Gathering of Native Americans, GONA, Tulalip Tribes, youth by Kim Kalliber. Bookmark the permalink.